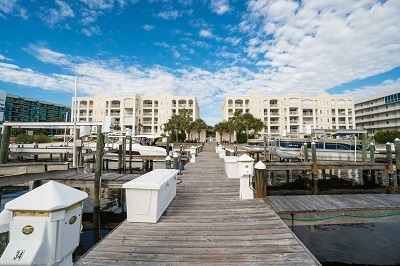 Orange Beach AL waterfront condo for sale at Perdido Grande. 3 bedroom 3 bath unit is perfect for family or guests, with each bedroom having it’s own attached bathroom. The master bedroom has its own private balcony, with another balcony off the living room. And the views are amazing, of both Terry Cove and Alabama Point. Sitting directly on Terry Cove, this is a boater’s dream location! This gated low-density complex has a beach, indoor and outdoor pools, exercise room, tennis court, is pet friendly, and has a marina! This unit conveys with boat slip #2, which has a 20,000 lb boat lift. Come see this one before it’s gone!